It amazes me how many cafes turn away customers. These are customers who have walked into the cafe, know what they want, and when they get to the counter they are told they are not wanted. They are given two options – buy more or leave. 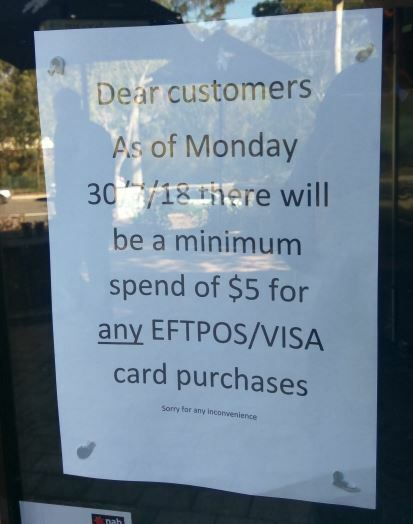 The justification for a minimum EFTPOS is quite simple – credit cards attract fees. Cafes and restaurants find things tough and it is very tempting to try and minimise expenses. With many EFTPOS transactions incurring a fixed fee, it is a big chunk of the profit stolen by the bank. The extended argument is that it will then cause of a customer to spend more money. They will add something onto their order to bring it up to the minimum, and so the cafe can actually make more money. Alternatively there are customers who come in, sit around all day using the free wi-fi and will only buy a single cup of coffee. My local cafe has just put up this sign to warn customers about their new policy. These are the arguments that they used. Imagine a regular customer wanting a cup of coffee and realising they don’t have any cash. (How often have you opened your wallet/purse only to discover the kids have cleaned you out). They only want a single cup and don’t want to be forced to buy something else. You have a minimum EFTPOS spend or there is the other place around the corner that doesn’t. The choice is easy. BUT that means you have just sent your customer to try out the opposition. What if they liked the coffee better, or the service? My local cafe is in an industrial estate. I often see a group of workers coming in for a coffee. They are all individuals, but all up they are buying a large number of coffees. What happens when one of them doesn’t have any cash on them? Surely one of the the others would shout. But do they want to rely on the generosity of others? Isn’t it easier just to go to the other cafe to get a coffee? And suddenly because one person doesn’t have cash, all of them head to the other cafe. I’m big into looking at the “emotional journey” that a customer has. For me, I’m a B2B (business to business) company that is selling a “boring” product on line. That, however, doesn’t mean that I provide a boring experience. I like humour. I inject humour into my web site and my emails. There is humour in our thank you letter. I want to bring a smile to your day. I want you to remember us with a pleasant memory because we engaged your positive emotions. For cafes, while great food is a bonus, the customer’s emotional response is more important. There are so many things that go into how a person will respond to a cafe including the staff, cleanliness, speed of service, the food, the price and probably even the weather. Good cafes will try to ensure that customers have a great experience. They want their customers to be happy, because happy customers are repeat customers. So why put up a sign that says that there are limits to what you are prepared to do for a customer? Why advertise the fact that you only want to serve a person if they are prepared to spend enough money in your cafe? Why advertise that you view a customer as a financial transaction, and are willing to loose them if they don’t measure up? The really ironic part of all of this is that it really doesn’t matter that much any more. Most customers spend over the minimum. In the case of my local cafe, it is only going to impact on a couple of people each day. It’s no big deal. So if most customers spend over the limit, why waste space in the windows and on benches telling customers that you don’t want them unless they spend lots of money with you? My challenge is simple – make a positive customer experience from what is going on. Let’s try to do something that will bring in more customers, not less. Let’s put up a message that will say “you are the most important part of our business”. Now what is the message? Now you are telling them that you are the answer to their problems. You have great coffee and they don’t have to worry about if they have enough cash. Now you are telling the group that they can always go to your cafe and know that everyone can buy something. Now you are telling them that their happiness is the most important part of your business. And that’s worth going out of your way for.